Mersive is pleased to announce that Solstice won two major awards at Integrated Systems Europe (ISE) 2017, the largest professional audio/video and systems integration event in the world. Solstice took home AV Technology’s ISE Best of Show Award and Commercial Integrator’s Top New Technology (TNT) Award for Solstice Multi-Room, which launched at ISE. The awards recognize top products based on criteria of innovation, ease-of-use, customer value, and advantages to AV integrators. Winning the two top product awards Mersive’s first year at ISE establishes Solstice as the capability-leader in the market and adds to a long list of awards won since the product launched in 2013. Solstice has won 11 top industry awards in less than four years in market, including AV Awards’ Conferencing and Collaboration Product of the Year, SCN’s Most Innovative Software Product, and InfoComm Best of Show Award for three years running. This track record of success is a reflection of Mersive’s ongoing mission to deliver the most innovative and effective solutions that drive real collaboration, productivity, and value forour customers and users. Solstice Multi-Room. The launch of the new Multi-Room capability takes the collaborative power of Solstice to new levels and once again redefines the content-sharing product category. With Solstice Multi-Room, users can connect and share content collaboratively across multiple participant locations and geographies on an enterprise network. Did you miss us at ISE? Learn more about Solstice Multi-Room and join our next webinar! When the Association of United States Army (AUSA) started planning for their new conference and events center, they sought to bring new levels of engagement and collaboration to visitors as well as a wow factor to the new center. 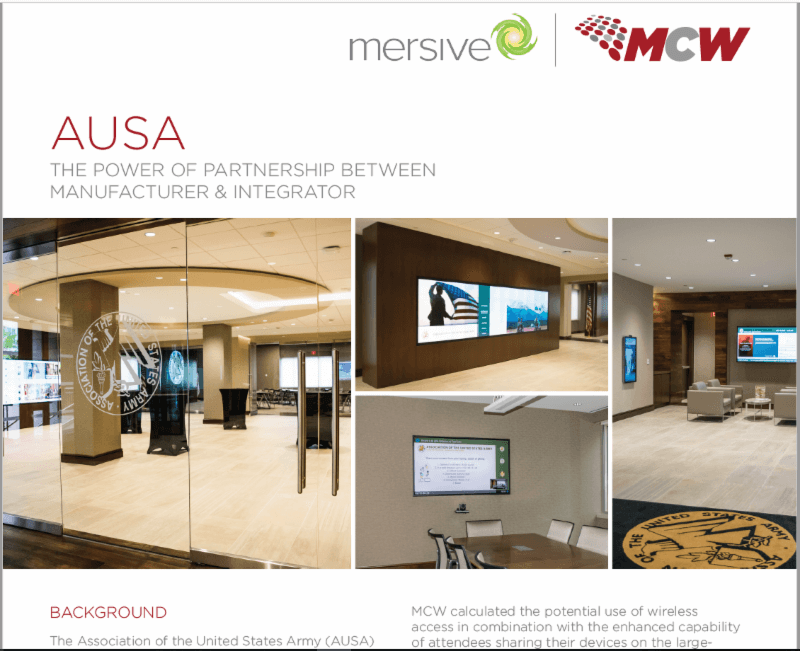 Check out the case study below to learn how Mersive partner MCW Solutions delivered on that vision by deploying the Solstice Pod in all the formal and informal meeting spaces across center. You can download the full case study at mersive.com/knowledge/. For additional Solstice resources, please visit mersive.com/knowledge/.